Heat oil in a wok on medium-high heat, add ginger, and stir well. Add bean curd and stir for a minute. Add water and stir for another minute. 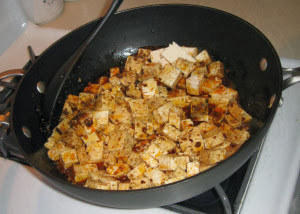 Add tofu and continue stirring for 5 minutes to coat tofu with bean curd sauce. Chinese bean curd is available in Asian stores and is a mixture of bean sauce, chili, ginger, garlic, sugar, salt, oil, and anise.